You have to journey to Arkhangelsk on the frozen northern coast of Russia to get a taste of a genuine rybnik, a leavened dough fish pie that is just as simple, rough-hewn and harmonious as the people who invented it. The people of Arkhangelsk province, on the coast of the White Sea, have retained their distinctive character and accent. Unlike the rest of Russia, the northern provinces never knew serfdom. Renowned for their courage and wit, the locals made their living in the olden days by fishing, hunting, and trading with the Scandinavian countries. Some Russians living in the vast Arkhangelsk forests stick to the old ways even to this day. One can still find Old Ritualists here, who stubbornly keep to the pre-17th century Orthodox Christian tradition. There is also distinctive local pictorial art, from the northern Orthodox icons to the ornaments decorating everyday household items. The old Russian cuisine also remains popular. Among them is the rybnik, which contains the whole fish with head and fins. There are two essential requirements for the fish that goes into the pie: it must not be bony, and it must be extremely fresh. You clean it, gut it, add a little salt, pepper and onions, and the day’s catch is ready to go into the pie. Since rybnik is a fisherman's dish, it must contain several kinds of fish. Those living close to the sea usually use halibut, the fierce-looking but very tender-tasting wolffish, and tuna, which is totally different when fresh from the boring and tasteless stuff in our freezers. 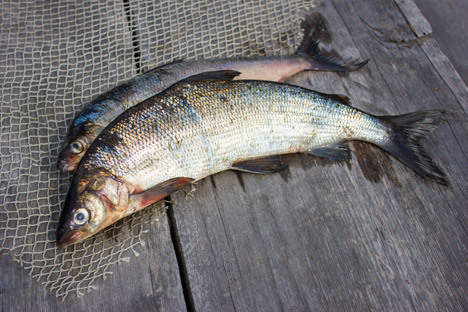 Those who live close to rivers and lakes prefer various kinds of fresh-water whitefish. The traditional Arkhangelsk rybnik is a closed pie; wheat, rye or mixed dough covers the fish filling on all sides. Once the pie is cooked, the top crust is sliced off and served separately. Another secret of this dish is that it takes a very special kind of oven to cook it. A proper rybnik requires a traditional Russian stove, a massive thing that can sometimes take up half the room. The Russian stove is designed to keep the house warm even when it’s minus 40°C outside and has a lot of very special design features. The most distinctive is that the opening of the chimney is at the front of the combustion chamber rather than at the back of it. The traditional Russian stove takes ages to start giving off heat, but it stays hot even longer. The particular temperature regime it provides makes it suitable for some dishes that simply cannot be cooked properly in any other way, and are therefore unknown outside Russia. The dough casing of the Rybnik must be at least a centimetre thick, so it takes a Russian stove for it to cook properly. The end result is a thin upper crust covering a porous bread mass underneath, full of magnificent fish flavor. Rybnik is served only hot: once it has cooled, the special magic of its flavour has gone. Unfortunately, very few traditional Russian stoves are still in use, so finding a proper rybnik requires a journey to the remote northern hinterlands. Many try to use a regular cooking oven instead, but the result is invariably a poor surrogate of the inimitable original.